The Ole Miss men’s basketball team is in Columbia, South Carolina, to battle the Oklahoma Sooners in the first round of the NCAA Tournament. 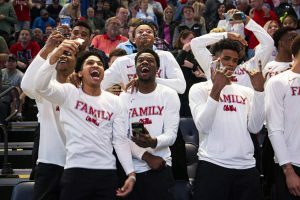 Ole Miss, 20-12 (10-8), was awarded with an 8-seed ranking by the Selection Committee on Sunday while Oklahoma, 19-13 (7-11), holds the 9-seed ranking in the South Region. This is the ninth trip to the Big Dance in school history for the Rebels and the first since 2015. While Ole Miss has no players with NCAA Tournament experience on the roster, head coach Kermit Davis is going dancing for the sixth time in his coaching career. “It never gets old, it never does. This is the third different team that I’ve been involved with — Idaho, Middle Tennessee and now at Ole Miss — and it just never changes,” Davis said. 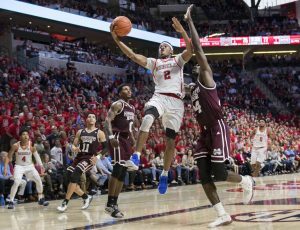 Having received a first-round bye, the Rebels were bounced from the SEC Tournament in the quarterfinals last Thursday, falling to Alabama after watching a 14-point halftime lead evaporate in front of their eyes. Breein Tyree, who was named to the first team All-SEC, and Terence Davis, who earned second team All-SEC honors, are coming off one of their worst performances of the season. The duo, who combined 34 points per game in the regular season, produced just 10 points on 4-27 shooting in the loss to Alabama. The Rebels can’t afford another sloppy game from their two offensive catalysts. Oklahoma, led by head coach Lon Kruger, will be making its sixth trip in seven years to the NCAA tournament. Like Kermit Davis, Kruger has had success with multiple teams, and is one of only two coaches (including Tubby Smith) who has lead five different schools to the Big Dance. Kruger’s postseason successes are highlighted by two Final Four appearances, the most recent coming with Oklahoma during the 2015-16 campaign. The Sooners are led by two All-Big 12 third teamers in Christian James and Kristian Doolittle. James, a senior, paces the Sooners, averaging 14.4 points and 6.3 rebounds per game. Doolittle, who was also named the Most Improved Player in the Big 12, enters the contest averaging 11.2 points with a team-leading 7 rebounds per game. Brady Manek rounds out the Sooners’ double-figure scorers putting up 12 points per game to go along with 6.1 rebounds. Outside of that trio, Oklahoma has only one other player averaging three rebounds or more, which is a cause for concern heading into the matchup with Ole Miss. Coming in ranked 175th in the nation in rebounding, the Sooners will be pressed to crash the boards against the Rebels who check in at 107th in rebounding in the NCAA. Ole Miss was 2-2 in matchups against common opponents with Oklahoma. While both teams shared wins over Vanderbilt, the Rebels’ other win came against Baylor while they fell in close contests to both, Iowa State and Florida. The Sooners went 2-4 in such matchups with a win over Florida in November, but were swept by Baylor and Iowa State in Big 12 play, including a 33-point drubbing at home by Baylor in late January. This first-round bout takes place in Colonial Life Arena, the home of the South Carolina Gamecocks. The Rebels may enter the game with a slight edge, having last played there just a month ago. “One of our staff members said we might end up in South Carolina and I just said, ‘Okay, I’m good friends with those rims,’” said Terence Davis, who scored 18 points in a February loss on the road against the Gamecocks. As of Friday morning, Ole Miss is just a 1-point favorite over Oklahoma according to ESPN. In the 136 times that 8-seeds and 9-seeds have collided in the NCAA Tournament, each seed has won 68 times.